Hey folks! Matthew Weiss here — weiss-sound.com, theproaudiofiles.com, and theproaudiofiles.com/workshops. That’s where you can find my new workshop series. 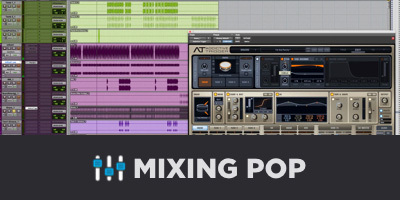 It’s a series of tutorials, each one delves into a very specific topic, for example, mixing vocals to a 2-track instrumental, and it fleshes out that topic over the course of about an hour to an hour and a half. Okay, this tutorial here is going to be a follow up to my crash course in vocal recording. This is going to be me speaking into a microphone with the microphone in different positions, each time I say the phrase, and I’m going to use this to help exemplify how different positionings of a microphone can affect the tonality and pickup of whatever your vocalist is doing. So this first one is going to be me just straight on into the microphone. Okay, so that’s just the microphone placed four to six inches away from my mouth, aimed straight at my mouth. One more time. So as you can hear, it’s a good capture. It captures everything. You can hear the low end of my voice. You can hear the very distinctly nasal quality of my voice. You can hear a little bit of the air and the top end in there. Like all around, you cannot go wrong with this sort of a capture. It’s never going to be bad. The only problem is you can hear a little bit of jumping in the low end, as some of the plosives might knock the microphone just a little bit. But overall, not bad, and nothing that a little screen guard couldn’t capture. Okay, this next one is going to be the microphone placed under my chin and aimed up at my mouth. Now, I’m going to play that one more time, and then I’m going to play the one aimed dead at my mouth, versus the one pointed under and up. Now, it’s hard to really pick out the differences, if you don’t have the vocabulary for it, but I think it’s apparent that there are some differences. To me, what I hear is a little bit less of the chest voice coming through, and a little bit more of what’s called the soft palate tone coming through. The soft palate is the brightness of the voice. What ends up happening is your voice shoots off the roof of your mouth, and that ends up forming the brighter tones, which is a little bit weird, but if you want to talk about the shine of a voice, it’s that soft palate sound. So to me, even though it’s a little bit more counter intuitive to think of it this way, if you want an airier, brighter sound, you actually move the microphone closer to the chest and aim up, because you get more of that soft palate, and if you listen to these back and forth, I would say that the second one, the one that’s under and aimed up sounds like it has a little bit more air and shine to it. Listen. Now, it also doesn’t have quite the same amount of body, but again, this is just getting slightly different tonalities, so if I was going for something that was supposed to be a bit glossier and shinier and didn’t have to be quite as full on, this would be a really great technique for doing it. Okay, so this next one is going to be one we’ve all seen probably a large number of times. This is going to be the microphone placed above my nose — slightly above my nose, and aimed down at my mouth. So, there’s a few things that I like about this and a few things that I don’t. It’s a tighter sound to my ear. It’s one where, you know, you still hear a lot of the direct voice, much like the vocal capture that’s straight on. What I don’t like is that you’re catching more of a picture of the center of the face, and less of the soft palate sound. So it ends up sounding a little bit more mid-rangey, and a little bit less airy. Let me play the one where it was caught from below and aimed up, and then followed by the one that was caught from above and aimed down. So, it’s a subtle difference, but you can hear that there’s a little bit more of the nose tone in that second — in the one from above aimed down. That’s because I’m closer in proximity to my nose. Here’s the dead on one. Right? So a little bit more nose tone. I call this the country/pop pickup. I find that it works really well when you want something to really cut through. It can work really well on some types of rock vocals. It just depends on how much nose you wants in a vocal. If the vocalist happens to have a very, very soft, sweet sound, and needs a little bit more mid-range to push through a mix, this is a very good choice for the capture. Okay. This one is going to be something that really only works in very controlled environments, but it’s the above capture, but it’s further out. We’re now about a foot and a half back. So this is actually kind of a cool sound. It’s one that doesn’t give you what you want right away, but it’s one that EQs nicely. We’re catching a lot more room in the sound, and you can hear the proximity difference. This is literally the same height, but I’ve slid the microphone back by about a foot and a half. So what I’m going to do real quick is just grab an EQ. Good old Hoser here. And I’m going to boost some top end into this first capture. I really like the way that one EQs, because that room tone, which gives it, like, a vibe and a natural ambience and things like that, comes up, and because it’s in the capture a little bit more, it just makes the vocal sound really shiny and kind of gives it this nice sort of life to it. So I’ll play the two back to back real quick, and maybe level match them a little bit, because this one is maybe like, a dB quieter. There we go. And obviously, it depends on what we’re doing. We’d do this if we wanted a roomier capture, or if we wanted a specific glossy tone to show up in a cool way. Okay, so now what I have here is just to exemplify the differences in the capture of the placement itself, I have this take, as done above my nose, about four to six inches away, but it’s not aimed at my mouth, it’s just aimed straight on. So it’s like, the dead on capture, just higher up. And you can hear I’m missing a ton of top end. I don’t have a great representation of the bottom end, and I’m really just focused on those nose tones. Here’s the dead on at my mouth. Here is dead on above my mouth at the nose. It suddenly sounds like I have a cold, right? Okay, now here is under my mouth, but instead of aimed up at my mouth, it’s aimed straight on at my neck. And what I think is interesting about this capture is you can hear a lot more of my chest voice. The low end of my voice becomes a lot more prevalent. The other thing that’s worth mentioning is that it’s actually a slightly brighter capture than the one that is above my face, and again, I’m reiterating this point, I know I’ve sort of beaten it to death at this point, but we think that the brighter tone is going to come from here, but this is really the upper mid tone that’s coming from here. The brightness is from the soft palate, and so when I have it — even when it’s off axis to my mouth, when I have it underneath, I’m capturing more of the brightness. It’s not a lot of the brightness because it’s off axis, but it’s there. Anyway, I hope that you guys learned something, because getting this kind of stuff right right off the bat is important. It’s not something you can really, truly, totally fix in the mix process. You can certainly improve things, but there’s nothing like getting it right from the start, and if you like this video, please don’t forget to click the like button, don’t forget to hit that subscribe button, and thank you guys for tuning in, I hope that you learned a lot. Take care.